A Canadian conundrum. Our first decent weather weekend had many ClubLink Members considering venturing outdoors but a day of great golf drama unfolded on our televisions to compete for our attention. And it was worth it. The incredibly fun Drive, Chip and Putt finals got underway early Sunday morning at Augusta National Golf Club. This amazing event got such a spotlight put on it when the Augusta National Golf Club added their weight to this grass roots initiative. Blue Springs Member Nicole Gal made the most of her appearance in the girls’ 14-15 division finals. Up against 9 other girls, Nicole stayed close through the Drive and Chip portions and claimed the title with two superb putts on the 18th green. Most of us have a few memories of putts on that green including Mike Weir draining a must-make to get to the playoffs and win his Green Jacket. Or Phil’s famous victory jump and of course Ben Crenshaw’s emotional reaction just days after the passing of Harvey Penick. We can forgive Nicole if her memories of putts on the 18th have a more personal angle! Than later in the day Canadian Corey Connors grabs his first PGA Tour win at the Valero Texas Open to punch his ticket to Augusta. Adding to the Canadiana atmosphere was his pal Mack Hughes waiting at the 18th with a cold beer for Corey to celebrate. It had a bit of a Jon Montgomery feel from the 2010 Olympics in Vancouver. 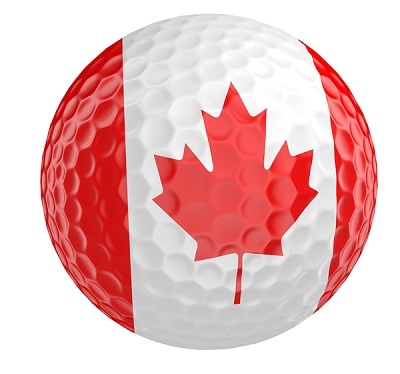 All in all, a fun day to wave our flag and celebrate Canadian golf. And it tucked tidily between the end of the regular season and beginning of NHL playoffs!